Designer suit from Isaac Mizrahi. This top quality 100% woven cotton suit scores for fashion and fit. Lots of style extras. The jacket has a notch collar, a welt chest pocket and front flap pockets. The lining is a contrast black ginham check. The pants have an inner waist band adjustment and sit on the hips. Runs true to size. 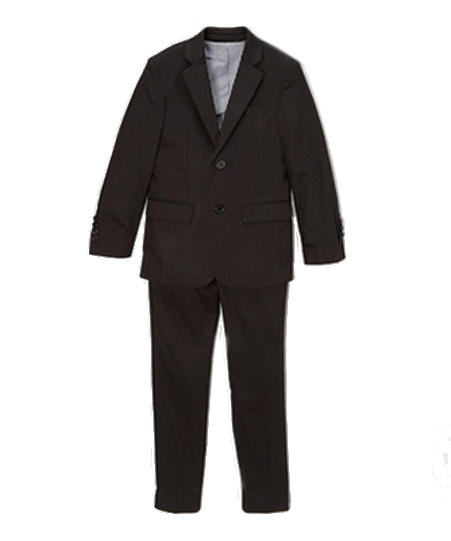 A 2-piece suit. Shirt and ties are sold separately. Machine washable though dry cleaning is recommended to extend the life of the suit. Additional features: 3 interior pockets, center back vent, matching trousers with adjustable waistband extended button tab with hidden hook-and-bar front closure and interior button tab.